This unit applies the discipline of social psychology to the nature of work, the ontology of labour and ergonomics. The unit explores ergonomic orthodoxy and shortcomings in relation to psychosocial and social-psychological well being. The nature of personhood requires a study of body, mind and spirit in relation to the social psychology of labour and as such challenges orthodox models of rehabilitation and recovery. The unit explores the many stressors on people in work and ways in which the workplace discriminates against the injured worker. The health, rehabilitation and recovery industries are investigated in relation to the challenges of developing resilience in workers and workplaces. The study of social psychological principles and concepts enables a new way of understanding why people do what they do, especially understanding how people make sense of risk. Radley, A., (1991) The Body and Social Psychology. Springer-Verlag, New York. Long, R., (2013) Real Risk, Human Discerning and Risk. Scotoma Press, Canberra. Participants will be expected to keep a reflective journal. The purpose of the reflective journal is to demonstrate critique and understanding of uses of principles of social psychology in relation to body, movement, work and well being. 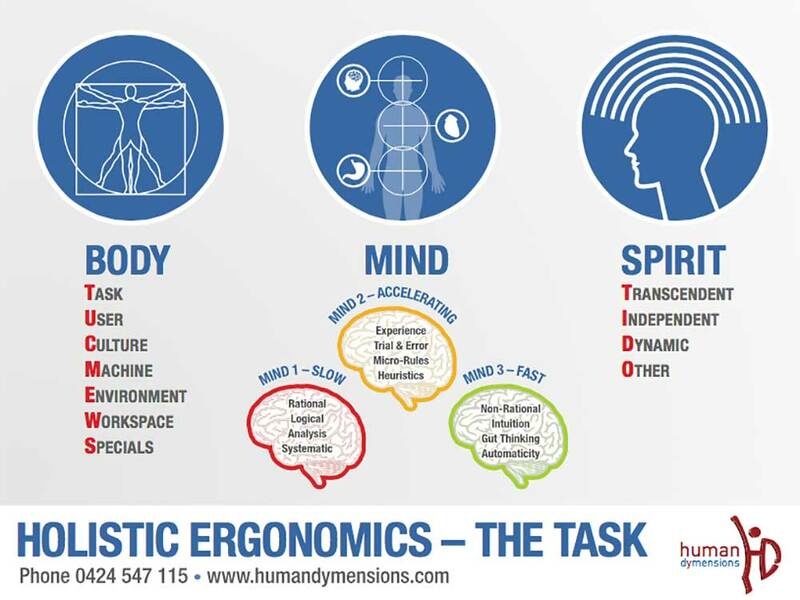 Participants should show connections between the challenges of unconscious and unseen stressors and orthodox ergonomic considerations. Your choice should be undertaken in consultation with the lecturer/coordinator. The important issue is to observe a diverse range of activities and the way these impact on the person holistically. Students will be expected to interrogate space and place (using the visual and special literacy tool) in experiential learning using the following questions as a guide. Who are these people? What is their profile? What is the work design and purpose? What are the visuals, space, place and environment? Describe the movement, stressors (+=-), by-products, trade-offs. What are some unconscious effects, aesthetics, connections? Kroemer, K.H.E., and Grandjean, E., (2003) Fitting the Task to The Human. Taylor and Francis, London. McPhee, B., (2005) Practical Ergonomics. Coal Services Health and Safety Trust. Kurri Kurri. Waldron, H.A., and Edling, C., (2004) Occupational Health Practice. Arnold, London. Van Stolk, C., Staeysky, L., Hassan, E., and Kim, C., (2012) Management of Psychosocial Risks at Work. European Agency for safety and Health at Work, Luxembourg. Bagozzi, R., Gurhan, Z., and Priester, J., (2002) The Social Psychology of Consumer Behaviour. Open University Press, Buckingham. Chopra, D., (2010) The Soul of Leadership. Rider, London. Egan, G., (2013) The Skilled Helper. 10th Edition. Brooks Cole. New York. Furedi, F., (2004) Therapy Culture. Routledge. London. Glendon, A., Clarke, S., and McKenna, E., (2006) Human Safety and Risk Management. Taylor and Francis. London. and Sport. Open University Press. London. Hallowell, E., (2006) CrazyBusy, Overstretched, Overbooked and About to Snap. Ballantine Books, NewYork. Herman, J., (1997) Trauma and Recovery. Basic Books. New York. Lyons, A., and Cromby, J., (2010) Social Psychology and the Empirical Body: re-thinking the relationship. Social and personality Psychology Compass 4,1. 1-13. Lukacs, G., (1978) Labour, The Ontology of Social Being. Merlin, London. Neville, B., (1989) Educating Psyche. Collins Dove. Melbourne. O’Neill, M., and Albin, T., (2011) Holistic Ergonomics. Knoll. Palmer, P. (1993) To Know as We Are Known, Education as a Spiritual Journey. Harper. San Franscico. Radley, A., (1994) Making Sense of Illness, the social psychology of health and disease. Sage. London. Reich, J., Zautra, A., and Hall, J., (eds.) (2010) Handbook of Adult Resilience. Guilford Press, New York. Schein, E., (2009) Helping, How to Offer, Give and Receive Help. Berrett-Koehler Publishers. San Francisco. Statt, D., (1994) Psychology and the World of Work. Palgrave. London. Sternger, R., (ed) (1995) Wisdom, Its Nature, Origins and Development. Cambridge. London. Victorian Workcover Authority. (2006) OfficeWise – A Guide to Health and Safety in the Office. Worksafe Victoria. Melbourne. Vohs, K., and Baumeister, R., (2011) The handbook of Self-Regulation. Guildford Press, New York. Watt, D., (2011) Everything is Obvious, How Common Sense Fails Us. Crown Business, New York. Wimberger, L., (2014) Neurosculpting. Sounds true, Boulder Colorado.